Momma on a Mission: Still nursing. Still loving it. Nursing is normal. You know what else is normal? Nursing a toddler. Nursing a preschooler is normal too. It's biologically normal, developmentally normal, and historically normal. It also works really well for me and my son. So why would I stop nursing him just because it's not socially normal for me to continue? I don't make a habit out of making decisions based on what society thinks of me, especially when it comes to the well being of my children. 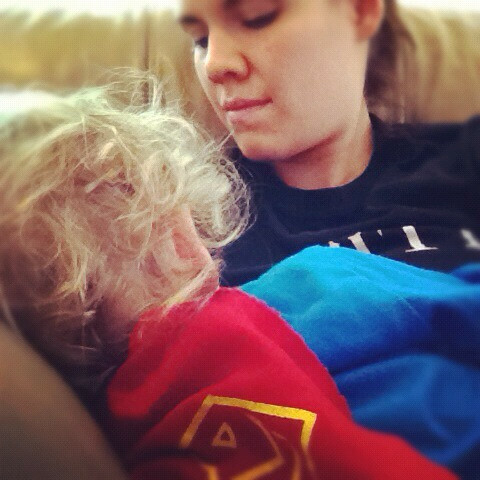 I think some people assume that a toddler nurses just like an infant does, but that's just not true. At this point, it's really not a big deal. We don't make a grand ceremony about it. I nurse him down to sleep every night, and every morning he climbs into my bed looking for his num nums. We snuggle and nurse for 5 or 10 minutes, and then he declares that he's "all done" and runs off to ask Daddy for a bananna. Nursing is just a lovely part of his morning routine. We don't nurse much during the day anymore, only every once in a while. We have healthy boundaries set too. If he wakes up in the middle of the night(which happens occasionally, but not often), he may nurse, but not all night. If he gets upset about that, I comfort him, but he still doesn't get to nurse all night. If he asks to nurse during the day, and I'm not able to nurse him for whatever reason, I say, "Sorry buddy, not right now", and he says, "Awww, man!" and moves on with his day. But most days, we only nurse first thing in the morning and as the last thing before he goes to bed. Extended breastfeeding has amazing health benefits. My breastmilk is still boosting his immune system and helping keep his gut healthy. My breastmilk still contains the cancer killing properties that it did when he was an infant. My breastmilk is still helping prevent my chances of developing breast cancer, and the longer I nurse, the lower that risk goes! My breast milk is also helping boost his brain- studies have shown that the longer a child is nursed, the more intelligent they are. Breastmilk is still the perfect food that it was when he was an infant, and it's changed along with him to provide just what he needs at this stage of his life. It's amazing! The psychological benefits are awesome too. Tristan and I have an amazing bond, and he's secure in the knowledge that I'll always be there for him. He's such a happy kid, and rarely gets upset enough to throw a fit or do other "terrible twos" things that are talked about. He's independent and adventurous, and loves to climb. He has a wonderful imagination, and is constantly pretending with his toys. He has a huge vocabulary, and often uses words like "actually" in context, like that's a completely normal thing for someone his age to do. He's cherished and well loved by everyone that knows him. Of course, breastfeeding doesn't get all the credit for that, but I do believe that nursing has had a big part in helping him become the awesome little toddler that he is. At the very least, it's clear that it's not hindering his development in any way. And on that note, Tristan and I have reached 2.5 years of nursing as of last week! I'm so proud of us! We've achieved and exceeded the goal that I set when he was born, which was to nurse for two years. I dare say that if things continue the way they're headed, we'll have no problem making it to three. Still going strong, still loving nursing!